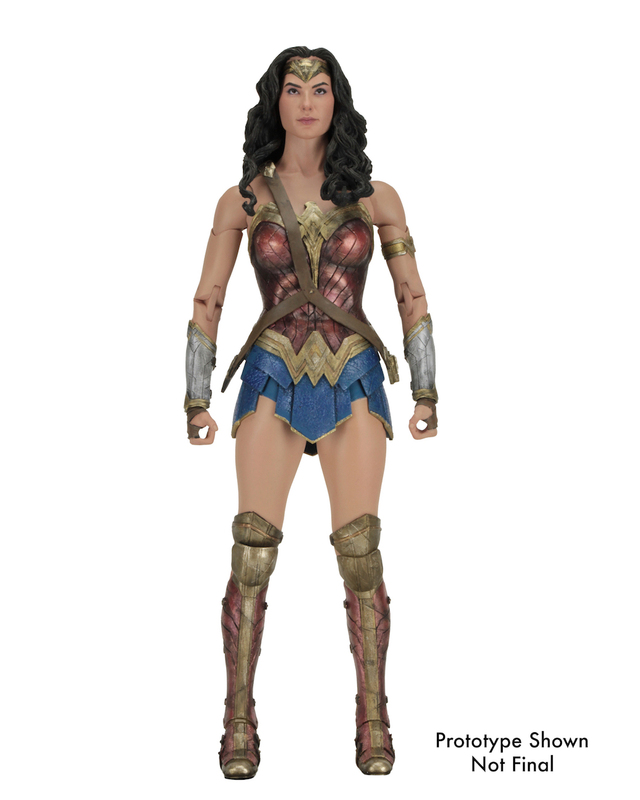 After being announced some time ago, we finally have out first look at the upcoming Wonder Woman 1/4 Scale Figure coming from NECA. 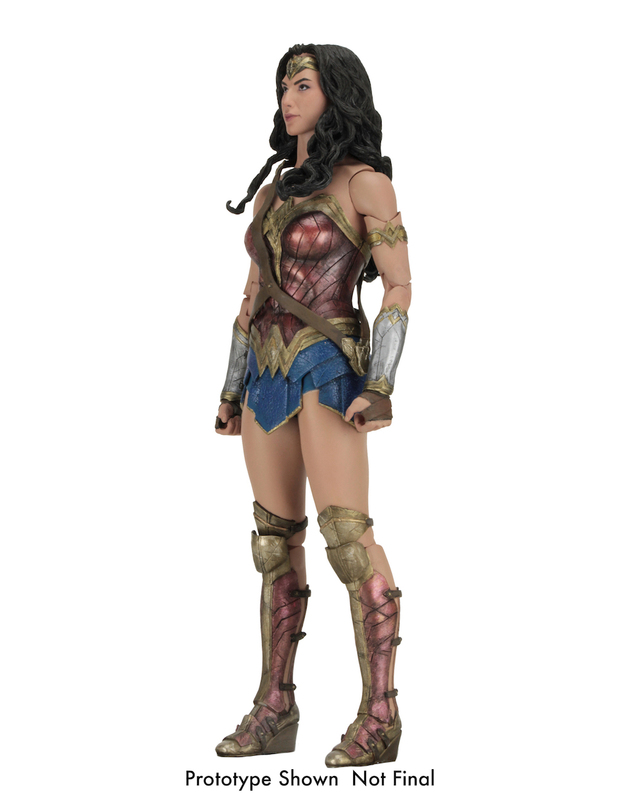 New photos and details have been posted, showing the non-final prototype for the Wonder Woman figure, which should stand about 18″ tall. 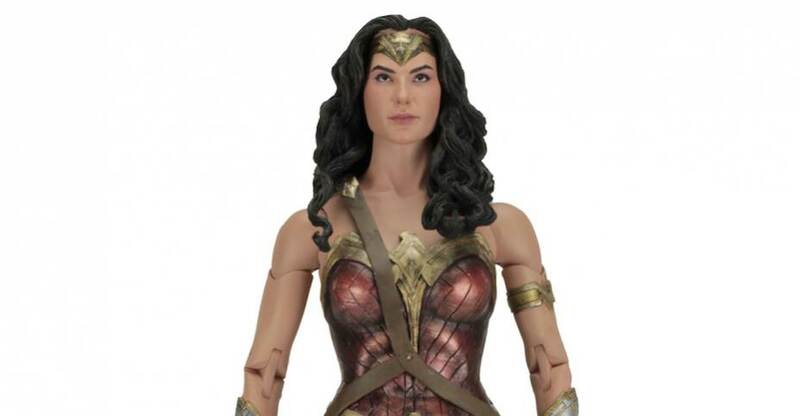 The figure will include interchangeable hands, a Lasso of Truth, a sword and a shield. 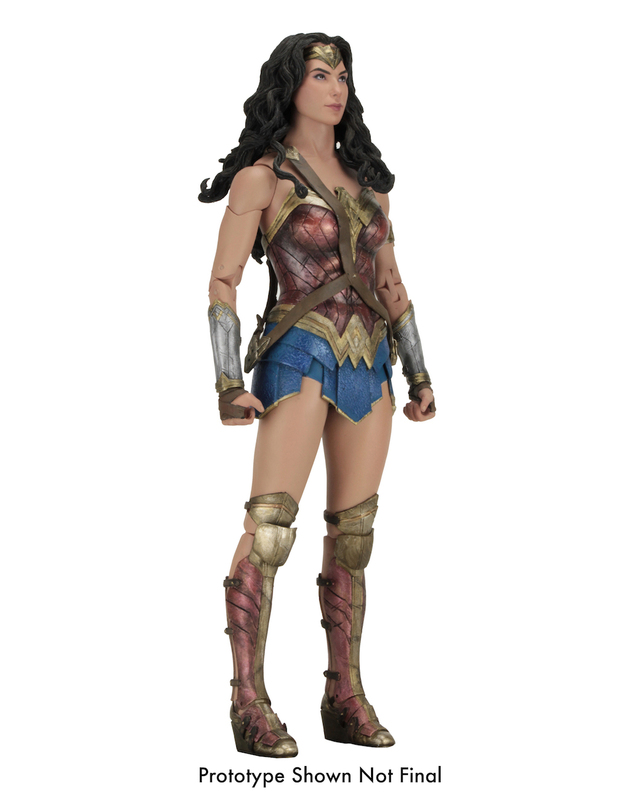 The Wonder Woman 1/4 Scale Figure is due out in November. See the new official photos after the jump. Well I am notin this fanbase so much as to pick this up but from a fan of the NECA 1/4 scale figures and figures in general I think I can already see some issues. Limited head articulation, no sword holster? the joints are not very seamless, etc. There really needs to be a back view on this one, it would help with seeing how the hair sculpt lays. AND what is she looking up at? That will be an issue too. I like that NECA is doing stuff in 1/4 scale, and that these clock in around $100, it's an affordable way to collect in that scale. 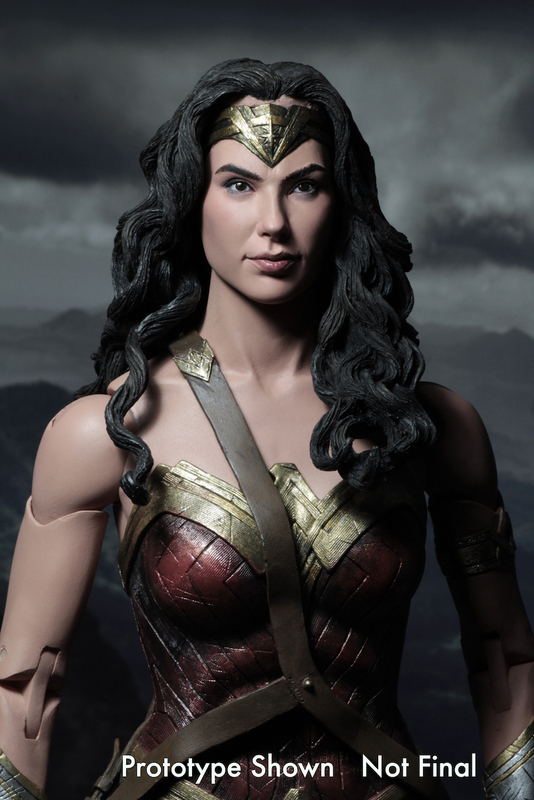 My feelings aside about Bat V Supes, or Gal Gadot as WW, this is not NECA's best work either. Even if NECA nailed this I'd not be interested, but this for me is a miss. Doesn't look as good as other pieces they've done. Best likeness yet IMO. Just need to lower the head a bit and get rid of the ugly double elbow joints and replace them with high ball hinge joints much Like Diamond Select has been doing for a while. They were close with Ultimate Drake, just neet to make the cut slightly higher. Oh.... and convert it to 7" scale. 1/4 is way too big. 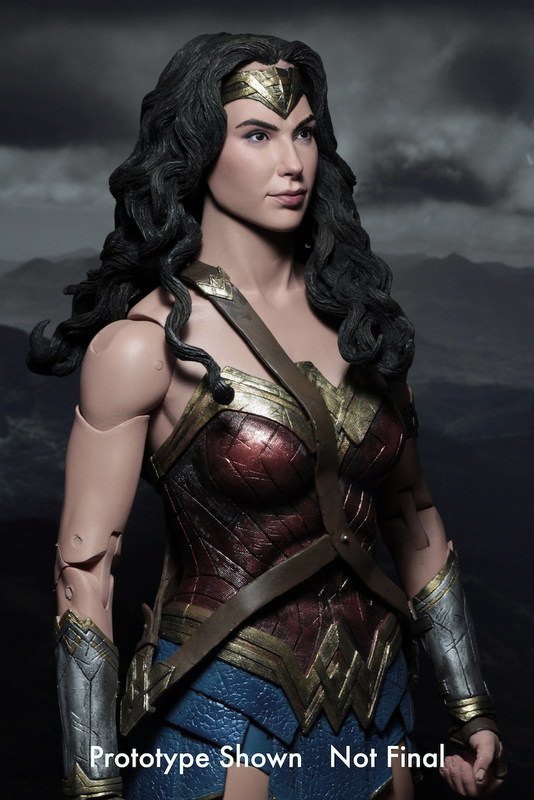 YYEEEESSSSS , this looks awesome , her likeness is really well done , especially for a 1/4 scale like this.. freaking loving NECA's 18inch figs.. will be definitely picking this up, hope they do more with the DCEU characters. 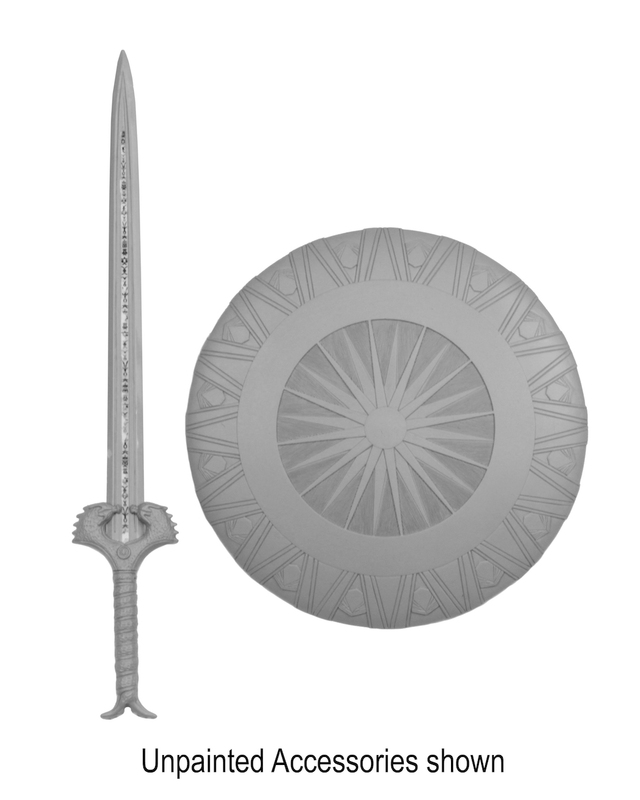 Movie Wonder Woman doesn't have a scabbard. She just uses a frog on her ugly brown belt, so NECA is accurate here. 1/4 scale is a little big to collect. All of the Lego Minifigures are 1/8 or 1/16 scale. Would like to find the smaller Wonder Women figure. ...LEGO Minifigures are ~1/38-1/40 scale. But it's happened in the past with the Batman and Harley Quinn figures. On Twitter Randy said something along the lines of lightning struck three times it's not gonna strike a fourth time. I hope this is misdirection or something but apparently it's a huge hassle to actually get the deal done each time they've done it. Usually when people ask about the 7" DC shrink-downs they get a "maybe" or "we'll see" not just "no." Well with their Superman and Batman V.S. Alien two packs coming out it may be safe to say that all bets are off at this point. And in response to your above post, I'm pretty sure Mattel only has the 6" scale licence. I think DC Direct had that license still but they dropped their planned 7" line. Hopefully this will leave a sufficient power vacuum for NECA to fill. They're the only ones really worthy of these franchises. Everything Mattel makes is total garbage; paint, sculpt, articulation. The only thing they've got is their seniority as they've been around much longer. You know they're terrified of Neca getting a full collector line as their crap wouldn't stand a chance. Hold up a Mattel Dark Knight Joker and NECA one... It pretty much speaks for itself. What Mattel has is (unfortunately) the master license. What this means is that they get a say in anything DC licensed even if they aren't involved. DC Collectibles has only managed to get through this because they are a part of DC itself and their products don't go to mass release chains like Walmart, Target, and TRU they go to comic shops and specialty stores. NECA has only been able to escape their 1/4 scale restrictions by hooking up with TRU directly to make promotional figures and now with two-packs that feature licenses NECA does fully posses. I would absolutely love for NECA to be able to normally produce 7" scale DC figures but unless Mattel has a serious change of heart or they lose their licensing deal it is unlikely. I appreciate this explanation. It makes little sense to me from a business standpoint, but I appreciate the explanation.